Our story started in the fall of 2008, before we were married. We were both working at a children’s ranch in Texas. I was the weekend respite for the girls’ house and school cook, Scott filled in wherever they could use him in the boys’ houses and school. We loved working with the kids, and I loved watching Scott work with the boys.There’s nothing more endearing then a man playing with kids. A year later we were married, a second marriage for us both, and living back in Canada. Scott has 3 grown children (who have been very supportive), I had none. My dream from when I was very young was to be a mom, but when we married it became very apparent that we would not be having children of our own. I grieved the children I would never have. It wasn’t long after that we both felt a desire to become foster parents. 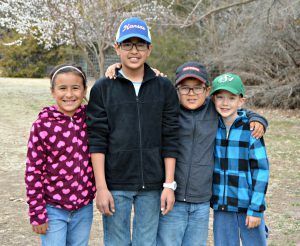 Because of our experience at the children’s ranch, we weren’t thinking adoption at the time, just a desire to give a home to children who needed love and stability for a short time. Our hearts were for older youth, but we ended up getting foster placements of infants and toddlers for the first year. Then early in 2010, we got a call from our foster care support worker telling us about a boy, almost 3 years old, who was legally free to be adopted, but his foster parents weren’t able to adopt him. Christian had a long list of concerns regarding his prognosis, as he was a shaken baby and barely made it the first night in the hospital at 5 weeks old.He has a sister a year younger who was being adopted by her foster parents but they chose not to take Christian. We said we wanted to meet him first, but that we were definitely interested. We had a meeting with all the specialists, and were able to meet him and his foster parents. It was at this meeting I realized I had actually played with Christian at a local McDonald’s just a few weeks earlier. Within 2 months he moved in with us. He was non-verbal and had several developmental delays, but we worked hard and prayed harder. He started catching up in leaps and bounds. The adoption process is lengthy in Canada, so Christian didn’t become a Galloway until December 2013. Everyone that meets him can’t believe he’s adopted as he looks like he is our biological child. A fun little extra! Christian is a people person and has been praying since he could talk for brothers and sisters and if you know anything about God, it’s that He hears the prayers of a child. We continued to foster children after Christian came home, but in the spring of 2014 we felt a call to be missionaries in Uganda, Africa. We sold our acreage, packed what we could in our vehicle, made the trip to Kansas to visit my family before heading out. While in Kansas, we started to feel something different. We both felt as if God was saying that maybe we needed to postpone Africa and stay in Kansas for a while. Things fell into place and here we were wondering why we were here. We felt to the need to begin the fostering process again. It didn’t take long to do the training and get licensed. Then 2 weeks after being licensed in January 2014, we got a call to be a foster family for a sibling set of 3 all under the age of 4. I immediately said yes, Scott was hesitant because you just never know what the kids will be like.There was no information on these 3; they had just recently come into custody. We agreed to go for it. They fit into our family perfectly and Christian was thrilled to have a ‘brother’ and ‘sister’s’. These three are still with us as foster children. We are ready to adopt them if their case plans move that way. In the spring of 2015, our neighbor was over visiting us and the little ones. She mentioned a sibling set of 3 kids (ages, 8, 9 and 11) in the school at where she teaches that are looking for their forever home.They had a failed adoption that past December and were heartbroken. We didn’t think much of it at the time except that it was a sad situation.Then about 3 days later, Scott and I were talking about them and both looked at each other with ‘that’ look. We knew we needed to pursue these kids to at least find out what their story was.The foster parents were very willing to meet as they were in a place where they needed the kids to find a new home.The workers were all on board with us meeting the kids to see if this would go anywhere. We had a first meeting with the kids at a park, where it was a random play time for all the kids and no one knew (except the parents) that we were there for any other reason. Scott and I immediately made the decision that we would take these kids into our home. We had to work out several details as we already had 4 kids, but the workers made it happen. We had a few overnight visits as respite. To help protect the kids emotionally, the kids still didn’t know we were doing this for them to start building a relationship. We met them in April. By the first of June we went to therapy with them all to tell them we wanted to adopt them. They were shocked and uncertain, but happy. They moved in with us on July 4th 2015 as a foster placement while we finished our adoption packet. On June 7 2016, they became Joshua, Levi and Bella Galloway. Because of the failed adoption, they were counting down the days for the actual adoption day. Once it came, we could see the weight lift and the peace settle on them all. Our question of why we are in Kansas has been answered. The kids are thankful that God changed our plans so that we could be their family, no matter what. And Christian is blessed with the answer of prayer for so many new brothers and sisters. Our family is beyond what we could have ever dreamed, but our hearts and home are open to any other special surprises the Lord may have for us.